As Hurricane Sandy continues to cause destruction in the Northeast and inland, images of the devastation show evidence of the storm’s immense power. Sadly, more than 50 people have already lost their lives in the storm, including a Brooklyn couple, Jessie Streich-Kest and Jacob Vogelman, who were killed by a falling tree while walking their Pit Bull Monday evening. The couple’s dog, Max, survived, and is currently being treated for head trauma at a veterinary hospital. Homes have been washed away in the surge, floods have shut down public transportation, and millions of people are without power. The damage done by Sandy has affected pets along the Atlantic coast as well, and though rescue efforts are underway this morning, many pets have been reported missing. Families who have lost their homes have been flocking to relief shelters, and thanks to the effort to include more pets in evacuation and shelter plans, many places of refuge will allow those effected by the storm to bring their furry friends along. Examiner.com released an updated list of pet-friendly shelters Tuesday evening. USA Today reports that even hotels that do not typically allow pets are making an exception for desperate families and their four-legged friends as the superstorm continues to ravage the Northeast. Rescue efforts are now underway in New York City for people — and their pets — who stayed behind during the storm. For any New York City evacuees that had to leave a pet behind in the storm, the city has set up a 24-hour hotline to report or check up on missing pets; the number is 347-573-1561. A Facebook page has been set up to help families throughout the impacted area who have lost pets during the storm. On the Hurricane Sandy Lost and Found Pets page, people can post photos of their missing pets or spread the word about the dogs, cats, birds and more they have found since the storm made landfall. The page has been updated frequently since its launch, and even helped a Border Collie from Staten Island find her way home this morning. Animal shelters in the Northeast have also been hit hard by the devastating hurricane. The Center for Animal Health & Welfare in Easton, Pennsylvania lost power during the storm, and has put out a call for help on their Facebook page this morning. Donations of bottled water, paper towels, linens, dog and cat food, and litter are needed, as well as ice to help keep pet medications cold. As Hurricane Sandy makes its way through central Pennsylvania and onward to Canada, leaving a path of devastation in its wake, there will be many pets in need of assistance during the recovery. 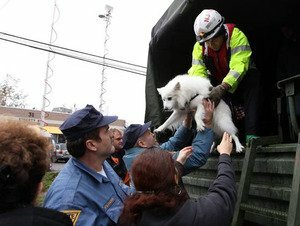 ASPCA Senior Manager of Media and Communications Emily Schneider suggests that anyone interested in lending a hand should check with animal shelters in the Northeast for lists of needed supplies, calls for volunteers, or information on how to make monetary donations towards the relief efforts. The ASPCA and PetSmart Charities have teamed up to help in the aftermath of the disaster. As of October 31, the groups have set up a sheltering supplies distribution center in Syracuse, New York, with PetSmart contributing $80,000 worth of much-needed supplies for pets. Animal hospitals along the coast have been busy since before Hurricane Sandy’s arrival, and as the storm plows north, many clinics are releasing reports of found animals. Lynn Animal Hospital in Riverdale Park, Maryland is one pet hospital hoping to reunite two dogs with their owners. A tan female mixed breed dog and large male Hound mix were taken in by the clinic yesterday, and staff is hoping to find their families soon. For more information about how you can help the people and pets of the Northeast recover after Hurricane Sandy, contact the Red Cross. The ASPCA and the Humane Society of the United States are also accepting donations through their websites.